It was the best of times, it was the worst of times, it was the age of wisdom, it was the age of foolishness . ( sorry Mr Dickens ). Of course decent to me meant spend money. You get what you pay for etc. So in Oxford Street London last October visiting with him I popped into John Lewis . Wonders of wonders they had a sale on of flip flops, which I guess makes sense really in England with winter approaching. The most expensive leather style flip flops with extra padding on the heel were reduced from £40 to £15 and as these were top of the range I pounced and grabbed the last pair. The draw back was that they were joined together with one of those security things that they remove at check out and anyway I really didn’t want to take my shoes and socks off in John Lewis on a busy Sunday. So they were placed untested in the suitcase for the trip. But hey £40 flip flops are going to be like walking on air aren’t they ? Well Hong Kong wasn’t the place for flip flops so it wasn’t until Bangkok that they came out of the suitcase and got a walk about. They looked good but were just a tad uncomfortable. Wear them in and they will be fine I told myself, £40 flip flops will be great after a day or so won’t they. That night in the hotel room the first aid kit also got it’s first outing of the trip and plaster was placed on both of my second toes and the poor little ones. My little piggies looked very sorry for themselves and certainly not fit enough to go to market, stay at home or eat roast beef. The next day was no better and so in Ban Krut I asked at the hotel where I could buy some new ones. Indeed my feet by then resembled those of an arctic explorer struck down with frost bite. I half envisaged having to take my toes off with some old rusted blade they way they always seemed to have to do in tales of exploration years ago. The hotel kindly took me into to town and to the only flip flop seller there. His choice was not great and so picking a pair was easy he only had one colour. My son was right, I have worn them almost everyday since I bought them, they have walked loads of beaches, trogged around temples, been into churches, been left outside mosques, seen good restaurants and tatty ones, sat in taxis, limousines and tuk tuks, had accidental swims in seas and puddles some with rather dodgy contents festering in them and generally been great companions as they have never moaned about their lot in life.These ones cost me 60 pence and the John Lewis ones were nicked in Vietnam when I accidentally on purpose left them outside one evening . I pity the poor Vietnamese who is now rueing the day he took them and looking at his swollen bandaged feet. Having seen me through thick and thin yesterday evening I forgot I had worn them up to the pool in the morning and and so left them there when I came back down to shower and head out. Once I discovered their loss I dashed to the pool but the lad had closed up and cleaned away. Lost I thought and was inconsolable as I cried into first my beer and then a rather large bowl of Singapore fried rice. brings tears to your eyes doesn’t it. Where you been ? 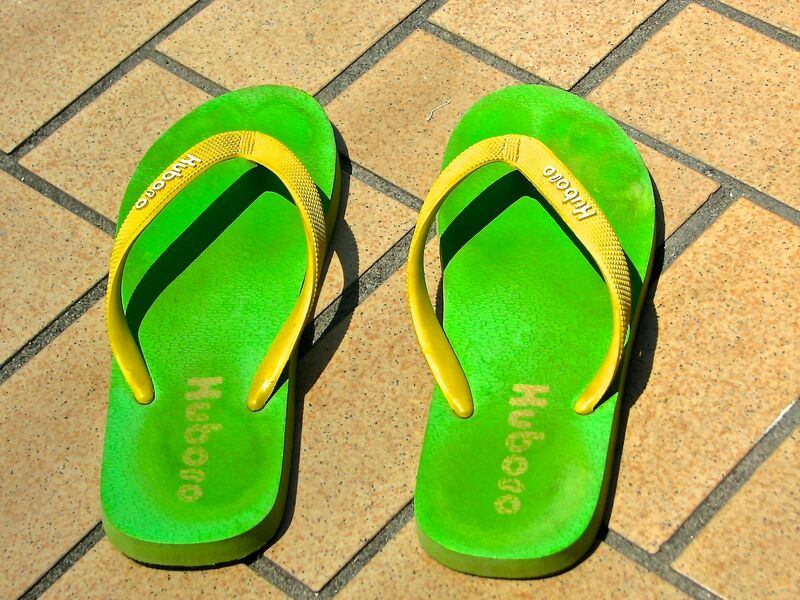 my flip flops said in broken Thai english , we worry about you, you getting old and forgetful. My flip flops sound just like my wife .